Posted on Thu, Mar 29, 2012 : 9:30 a.m.
Former Michigan goalie Shawn Hunwick, just five days removed from his last game for the Michigan hockey team, suited up for the Columbus Blue Jackets on Wednesday. Rich Hunwick is a big fan of the Detroit Red Wings, but even he couldn’t stay tuned for the entirety of the 7-2 thrashing the Wings put on the Columbus Blue Jackets on Monday night. When Detroit was up 6-0, he turned off the game. Hunwick planned to tune in again Wednesday. Little did he know, he’d be pulling for the Blue Jackets. 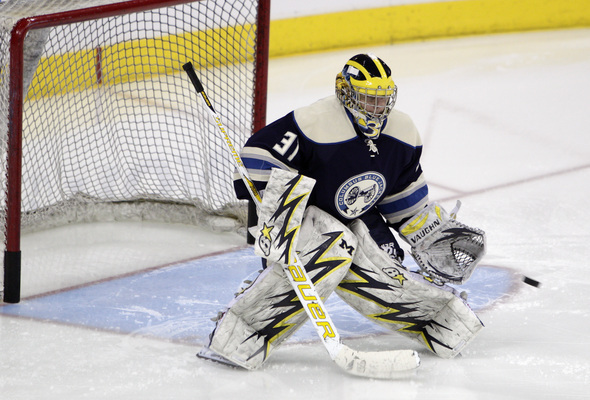 On Wednesday, Rich’s son, former Michigan goaltender Shawn Hunwick, signed an Amateur Tryout contract (ATO) with Columbus. When Rich helped Shawn move to Ann Arbor five years ago, it was to be a third-string goalie; the backup for the backup. On Wednesday, Shawn called his dad to tell him he’d be the backup on an NHL team. Rich never thought he’d see Shawn wear a winged helmet and a block ‘M’ in a game for the Wolverines, except maybe in a cameo performance on senior night if he was lucky. On Wednesday, he watched an even more unlikely scene: Shawn wearing that winged helmet and block ‘M’ in Columbus for the Blue Jackets. It was about as unlikely a sight as seeing a 5-foot-6-inch goaltender suit up for an NHL team. Rich later reflected on the circumstances that led to Shawn even being considered for a call up. Players leaving early and de-committing from Michigan and injuries to Bryan Hogan helped Shawn get a chance to prove himself at Michigan. On Wednesday morning, a puck to the helmet of Blue Jackets starter Steve Mason left the already goalie-strapped team short a backup as Allen York got the emergency start. Rich laughed as he went down the list. “I should give him some money and have him start gambling for me,” he said. Rich wasn’t able to make it to Columbus for the game because of work — he's employed in the maintenance department at Grosse Pointe Public Schools — but later said he should have just left early. Once he got the news, he wasn’t very productive. If Shawn is signed for the remainder of the season, Rich definitely will be in attendance when Columbus plays at Colorado next Thursday. His older son, Matt Hunwick, is a defenseman for the Avalanche. Rich got to experience the next best thing to seeing another son skate for an NHL team Wednesday. He got to tell everyone at work about it. “It’s just been an exciting afternoon. The guys at work were pretty pumped, too." said Rich, who made sure to keep his cell phone on him all afternoon. He was on call in case Shawn’s two-seater pickup truck couldn’t make it the whole way. But the Ranger — actually a 2003 according to Shawn — did make it to Nationwide Arena, and Shawn, winged helmet and all, made it on to the ice for the Blue Jackets. Back in Ann Arbor, Drew Gentry, Nick Gottz, Evans Mullan and Mark Bernier, all Michigan students and hockey season-ticket holders, watched the game from their booth at Good Time Charley’s. All admitted when they first saw Hunwick in goal at Yost they were scared, but confident by the end of his career. When they saw him skate onto the ice on Wednesday in Michigan gear, they said it made them proud. Gentry is from Alpena, where he used to watch Hunwick play junior hockey for the Alpena IceDiggers of the North American Hockey League. At IceDiggers games, Gentry never imagine he was watching a future Michigan starter in net, let alone someone that would make it to the NHL. incredible. You don’t expect to see the small-town folk going up into the big leagues, but it happens and it’s pretty incredible that Shawn had the opportunity,” Gentry said. Former Michigan defenseman Jack Johnson, who was recently traded to Columbus, was excited to see Shawn wearing the Michigan gear in Columbus. Shawn's status with the club is uncertain. If Mason’s not ready to return or if the last place team doesn’t want to take the risk of further injury just to play out its final five games of the year, Hunwick might sign a deal that would retain him for the balance of the season. If Hunwick does sign, he'll be the backup to the backup, unlikely to see any game time or get any consideration for the future. --J. Justin Boggs of ColumbusWired.net contributed to this report. Fri, Mar 30, 2012 : 12:55 p.m.
Bravest kid alive. Wearing U of M helmet in Columbus in the middle of OSU territory. Thu, Mar 29, 2012 : 2:50 p.m.
Great story about a great Michigan Man.